What is Virtual Reality (VR)? It used to be a buzzword, but in the last few years, the adoption of VR by brands and consumers alike has allowed it to grow into a full-fledged means of providing immersive experiences. Today, it is possible to record a full 360 video of a space or experience by simply pressing a button. This instant 360 capture of a space not only signifies the democratization of VR, it also marks the beginning of consumer created content. In the past, creating VR content was complex, time consuming and costly. Now that any consumer with a 360 capable camera can create their own immersive experiences and share them with friends and family, the world of VR is about to get much more engaging and meaningful. Anticipating the wide adoption of VR by consumers, the infrastructure of content distribution is rapidly expanding. Major players such as YouTube & Facebook have already enabled 360 video content in their platforms, making it that much easier for users to share their own 360 videos. Think about it—when the notion of photography was first invented in 1839, it revolutionized the world not just because it simplified the act of capturing a scene, but also because it did so in a mechanical way with incredible accuracy and detail. Today, we are able to not only capture an isolated frame from a scene, but in fact the whole 360° environment. This means that as a viewer, you are no longer just passively watching the content, but engaging with it like never before. The nature of VR content lends itself as a perfect medium to capture full environments and experiences; from skydiving to a special holiday dinner with the family, the true appeal is in the immersive aspects of the medium. The concept of VR is simple in notion but complex in practice—replicate an environment and enable the viewer to feel immersed in it through visual and/or audio sensory experiences. With the increased ability for consumers to easily capture and share immersive content comes new ways to absorb video content. In the past, the videographer or director was the one who told the viewer where to look and what was important, but with immersive content from 360° capable cameras, the user now has all of the power. Every video can now be experienced in any number of ways based on who is watching. It is possible today for two people to view the same content and have totally different experiences. For example, if two friends watch a video shot in 360° of a performance, one might focus more on the stage and the performers, feeling as if they were on stage with them. The other person may look into the crowd and see someone singing along and knowing every lyric of every act. Both see the same video, but each comes away with a totally different experience based on what they feel is interesting. Viewing this content in all of these different ways can lead to repeat viewing by consumers because of all of the possibilities. The consumer is now the director, choosing what is important and how they want to explore a piece of content. The videographer is no longer in control of the viewers’ experience. The camera can see everything in the scene, so the narrative is now in the hands of consumers more than ever before. Most current 360° capture devices have one of two pain points for most users. Either the content is low quality in its final output or the process itself to create the 360° sphere is overly complicated with advanced stitching and editing. 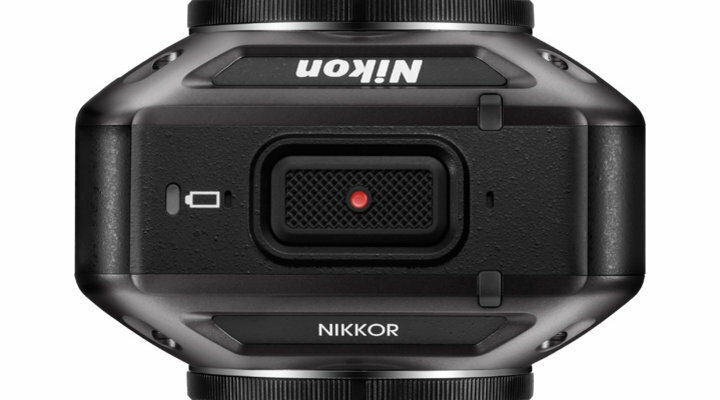 At CES 2016, the Nikon KeyMission 360 was unveiled, giving consumers an easy, high-quality solution to creating 360° content. The KeyMission 360 captures an entire scene in full 360°; above, below, and all around the camera. One press of the record button captures the full 360° sphere. This means that when you get the file out of the camera it is already ready to be shared online for all of your friends, family, and followers to see. Not only is the capture easy, but the video captured by the KeyMission 360 is 4K UHD quality, which means it will be clear, sharp, and detailed so that viewers can be as immersed as possible in the content. VR is exploding into the mainstream and with all of the new technology being developed it is easier than ever for consumers to create, share, and experience immersive media. This new wave of content is changing how viewers and content creators think about video content, and every day new techniques and technologies are being developed to change how we capture and enjoy VR content. Are you ready for the VR revolution?